How Claiming Creative Control Helps Women Musicians Stay The Course The 1990s saw a wave of prominent women musicians who took the reins, creatively and professionally, over their music — and provided a blueprint for lasting careers. 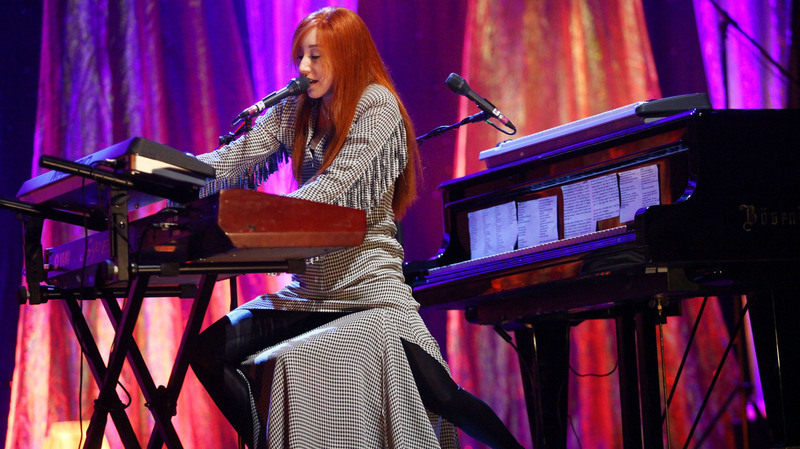 Tori Amos (shown here performing in 2009) was part of a wave of women musicians who took the reins, creatively and professionally, over their music in the '90s. Tori Amos made her major-label debut not with her landmark album Little Earthquakes, but with an embarrassingly cheesy hair-metal album, Y Kant Tori Read. It was 1988, albums by Bon Jovi and Poison were selling like crazy and Atlantic Records — Amos' label at the time — wanted her to try something similar. It was a massive flop, but Amos came out of it with the chance to fight for the piano-driven music she had wanted to make all along. Atlantic relented, and Amos' next two albums — 1992's Little Earthquakes and 1994's Under the Pink — were strong sellers that cemented her identity as a quirky, inventive songwriter with incredible musical chops. Behind the scenes, Amos took greater control of the business side of her career, too. She has retained the publishing rights to her songs since her early recording days. She recorded in far-off places like a hacienda in New Mexico and a church in Ireland. And, after feuds with two major labels — Atlantic and Epic — now records in her home studio in Cornwall, where she's the reigning matriarch. In the early 1990s, when Amos came to prominence, women musicians of all kinds were breaking down barriers within rock and roll. During that era, the punk-feminist riot grrrl movement put women front and center, empowering them to decide for themselves how they would sound and look — and how their sound and look would be marketed. It also spawned pop-grunge forces like Hole and The Breeders. A few years later, Canadian crooner Sarah McLachlan assembled the Lilith Fair festival, proving to the male-dominated music industry that an all-woman fest could be a rainmaker. The '90s saw a wave of prominent women musicians who, like Amos and McLachlan, took the reins, creatively and professionally, over their music. Artists like Ani DiFranco, Björk and Joan Osborne staked claims in the business side of their musical lives and paved the way for lasting careers in music while other artists who seemed more manufactured by the whims of record labels — such as The Spice Girls — have largely fallen off the radar. The music-biz playing field today is still far from level. But when the wave fell away, the choices these women artists made left them well-positioned to maintain the momentum of their careers — making them examples to younger artists of how to craft a unique sound while sticking to their creative and business goals. For Amos, having the independent space of her home studio is important for maintaining this control over her music; she says it has given her the freedom to tinker. "Being able to work with people in the studio without time constraints takes one stressful element off the table," she says. "There's more time to experiment with different arrangements. The first idea is not always the best." She also makes sure the space is welcoming so that collaborators feel comfortable bouncing ideas off her. "Some studios can feel clinical and you can taste the fear when you walk in the room," she said. That freedom has paid off handsomely for Amos, who remains relevant 30 years after Y Kant Tori Read sunk. She released her 15th studio album, Native Invader, last fall, to popular and critical acclaim. Claiming artistic control and business savvy early on can help women establish a rock-solid career in music, says Evelyn McDonnell, a journalism professor at Loyola Marymount University and author of books on women in rock music. "It's definitely true that, as much control of your career that you can hold onto from the very beginning, it will pay off in the long run," McDonnell said. DiFranco, for example, built a strong following precisely because of her independent streak; she has released more than 20 albums on her personal label, Righteous Babe Records, since the 1990s. For any musician — but particularly for women, who are still fighting to be treated as equals in the music industry — being a good businessperson, understanding the music you want to create and knowing how to negotiate and sell it effectively can improve your chances of a long career in music. However, McDonnell admitted that it can be much easier for women musicians to pull that off when they already have a financial safety net or another form of solid support. Lacking those things can lead musicians to jump at the first awesome-sounding record deal, even if it means sacrificing creative control or a fair share of the profits, she said. Having a strong safety net can also give women the confidence not to give up when the hits stop coming. That was certainly true for Osborne, who built a strong following playing clubs in New York City and throughout the Northeast for years, and began releasing soul and roots-music records on her own Womanly Hips label in the late 1980s. Then, Osborne seemingly lucked out: Mercury Records signed her and she hit it big in 1995 with her album Relish. But she found herself somewhat outside her wheelhouse on her biggest hit, "One of Us," which went to No. 2 on Billboard's Mainstream Top 40 in 1996. "Certainly, it was very different from what I'd been going as a live performer, although the rest of the album really put a lot of that American roots music into those songs," Osborne says. "But ['One of Us'] had, and still has, a level of uniqueness in asking this kind of spiritual question. There's a depth to it." Ultimately, Relish spent more than a year on the Billboard charts and went triple platinum in a little over a year. But when it came time to record her next album, Osborne says she found herself unable to deliver a follow-up that was likely to perform as well. "It was really rough," she says. But having a fan base she built independently allowed Osborne to continue making records and touring the globe as a working musician. "I'm in a very lucky position." In the years since Relish, Osborne has released eight studio albums, including original work and a slew of covers — mostly in the soul and R&B vein. Her most recent album, a collection of Bob Dylan covers, is her first on Womanly Hips since the early 1990s. She continues to tour, was nominated for a Grammy in 2013 and performed live with Mavis Staples in 2015. There's plenty to learn from these women who built multi-decade careers in music by claiming creative control, and the music industry clearly could use some of those lessons now. A 2017 study from the USC Annenberg School of Journalism found that, between 2012 and 2017, female artists were involved in less than 30 percent of 600 popular songs surveyed — and that figure was at a six-year low — about 17 percent — in 2017. Less than 13 percent of the songwriters for those songs are women, and the ratio of male producers to female ones among 300 popular songs was 49 to 1. No woman has ever won Producer Of The Year, Non-Classical at the Grammy Awards, and no woman has even been nominated for the award since 2004. "The lack of women in roles responsible for creative direction across visual and audio entertainment is troubling," the researchers said. "This appears to reflect deeply‐held biases related to women and leadership. Addressing these beliefs is paramount to opening doors for women in all creative roles, and offering females a chance to shape the cultural narratives and landscape in which entertainment is made." Of all the women artists who emerged during the fertile, business-smart '90s, Björk may be the one to study. She'd already gained a strong following during her years with the Sugarcubes, giving her a readymade fan base when she released Debut, her first solo record, in 1993. She has released eight studio albums since, each one a reinvention of both her sound and her public persona. On the cover of her latest album, Utopia, her features are obscured by baroque, alien makeup by Berlin artist Hungry — yet there's no doubt who it is looking back at you. Björk has maintained meticulous control over her sound, look and production from the early days of her solo career. "I got my laptop in 1999, and it totally liberated me from the studio," she told Red Bull Music Academy last year. "I could do 90% of my music in my bedroom. I could basically make up the dream but make the dream real." For Björk, each album is an exercise in world-building; she invites the listener on a journey to a specific space whose colors, sounds, conventions and language she has invented. Although Björk's work is strongly driven by her collaborations with others, she remains its core, the weaver threading the loom, bringing disparate threads together in a cohesive and layered tapestry. And each one is fresh and relevant — and well ahead of the day's musical trends. Björk's dedication to her creative vision could have left her adrift in obscurity years ago, but her approach is always generous and inviting, drawing people in rather than keeping them at a distance. Perhaps her commitment to executing her singular vision, combined with her collaborative spirit, can can lead to a future where scores of young women musicians feel empowered to do the same. Perhaps it will lead to a new generation of women musicians who excel on their own terms, setting pop-culture trends rather than being molded by them — despite persistent, sexist barriers.